Following is a compilation of posts I shared over two years. 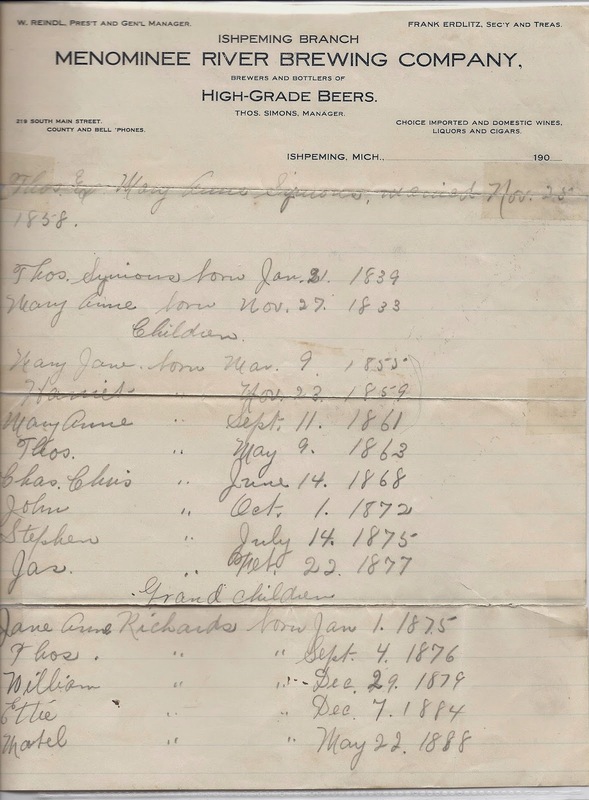 They trace my quest to know my great great great grandmother, Mary Ann Simons. Personal circumstances call me back to Mary Ann's story now. Below, I share my search for her. It is a multi-layered journey that gave me many gifts that "now more than ever" I treasure. When I felt the pull to do this, it was easy to choose the person to study. Mary Ann Simons had caused me the most frustration as I filled in the names and dates on my ever-growing chart. I had a handwritten family tree from the early 1900s but as it turned out, this voice from the past gave me the misplaced confidence that my Simons' branch would be the easiest to place on my family tree. It was one of the most frustrating. New names could not be found. The family's constant moves made them difficult to track. When other branches revealed themselves with so little effort on my part, this one continued to hide in the shadows of poverty of mid-nineteenth century Cornwall. But more about this later. Holidays and special events always included the larger Simons' clan. Perhaps it was because I felt familiarity with this branch of my family tree that made these ancestors so compelling. 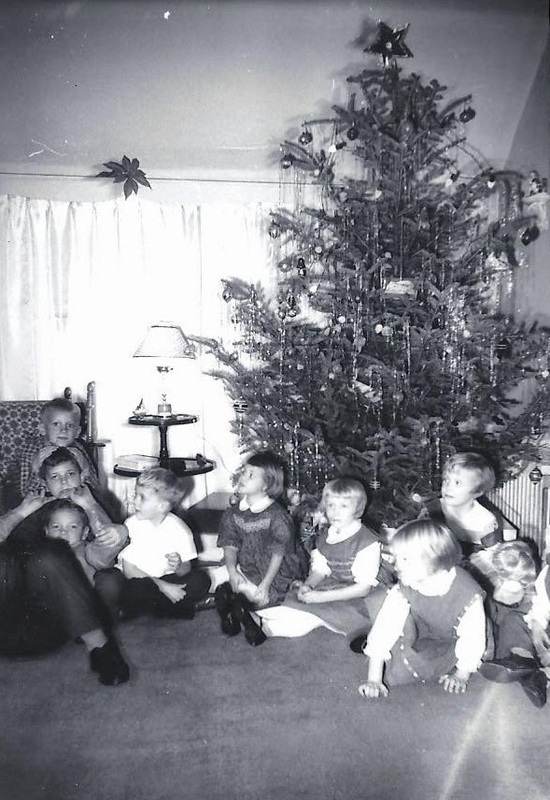 The family gatherings at Helen Lake and the Christmas celebrations with the Simons’ branch conjured up the warm fuzzy feelings of my childhood. The picture in the gold gilded frame. I was fortunate in that long ago a relative with personal knowledge was able to identify the people and approximate years of the photo. A faded framed photo (above) of Mary Ann's daughter, Harriet Simons, and family had hung in a prominent place in my home for so long. Its gold gilded frame a stark contrast to the forlorn faces that stood silently in front of an old black and white farmhouse. The picture had invited me into the family scene since it hung in my own grandmother's house. In it, Mary Ann's grandson, Thomas “Pa” Richards, held a large parrot, a precursor to our oft-discussed conversation of the “pet gene” shared by so many in today’s family. 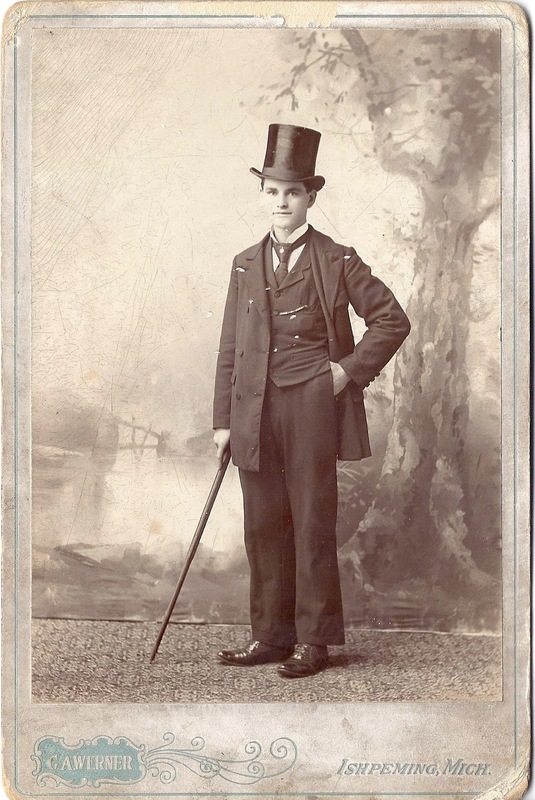 One of several "cabinet photos" of Tom Richards. It was the Richards side that seemed to favor taking these and sending them to England. Part of my genealogical journey in that era, a time before the Internet and ease of finding records on-line through Ancestry.com, consisted of trooping to the Marquette County Courthouse and paying for marriage licenses, birth records, and death records, anything to fill in the gaps for at that time that was all I was interested in doing. But after returning to Maryland, life took over. I put all those papers carefully away, waiting for the time when they would speak to me again. My treasured paper, one I believe was written by Harriet. It shows the variations of the Simons spelling. My more recent foray into the past began just after my dad’s death. It’s funny how death draws me to the family tree; perhaps I have a deep-seeded need to feel connected at these times. I believe my search to be a part of my personal grieving process. Somehow knowing that I am but one person in a long line of family that has been and that will be, is comforting to me. So, I tacked posters to my office wall, joined Ancestry,com and was off on the journey to connect with my past. In that strange way “the universe” has of speaking to us, it was not my dad’s family whose path I ventured on, but rather my mother’s branch of the tree beckoned. Was it the familiarity of them that drew me to their lives in particular? There is no answer to that yet, but I remain open to all the possibilities. 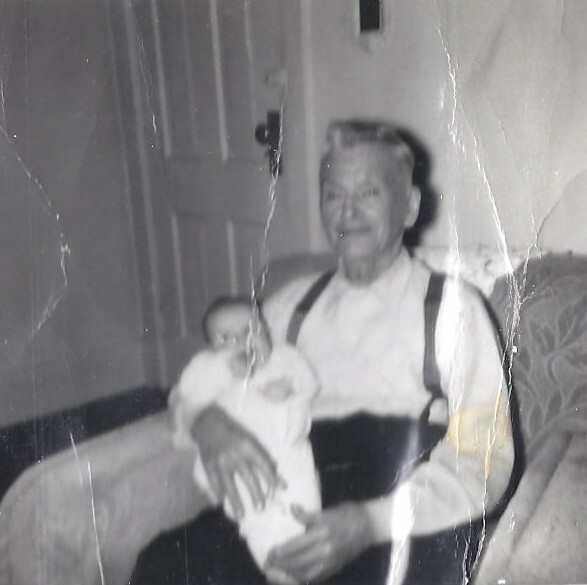 I combed through old photos, scanned from the black-paged album that was shedding its pages in my mother’s closet. The barrage of questioning began as I strove to squeeze as much information from my mother as possible. Never one to tell a detailed-laden story, replete with whose second cousin married the neighbor in 1938; she is hesitant to pull details from her memory. There is nothing wrong with her recall; rather I think she holds her life close, perhaps not realizing the treasures she holds. I learned that if I provided a key word or name, a valued anecdote might spring forth. Mentioning Hjalmer G(J)erling gave me a story of her young excitement that there was enough boiled dinner in the pot so he could stay for a family dinner. Gems like this would have been told by my dad so many times that we could and would have recited the details with him. But my mother is different. Once she casually mentioned that my grandfather had provided for his parents during the depression years. Had it not been for him, she said, they would not have had food. This was a new swathe in her family portrait and made me realize how much she holds that still needs to be painted onto the canvas. As I began the process of uncovering my mother’s family, I had that special paper of old to guide me as I searched for the names and dates of the Simons’ branch. It held more information than the little I knew about her Millmans and Richards, so I naïvely thought I would fill in those hand drawn Simons’ tree boxes with ease. The word naïve is entirely accurate here as I was a novice, easily shrugging off advice to look carefully at siblings and the details of census records. I just wanted to move that family tree to its tallest branch. I was fanatical about collecting a quantity of greats in front of the words grandmother and grandfather. I paid for marriage licenses and death but was not yet infatuated with the richness of these lives. I just wanted to move from the 1900s to the 1800s to the 1700s. But one woman stood in my way: Mary Ann Simons. This nexus of personal connections and irrepressible roadblocks likely resulted in my feelings of closeness to this great great great grandmother. She was my mysterious matriarch; yet, she was a barricade, the gatekeeper that prevented me from traveling back in time along this family line. Her name had been in front of me for so long on the decaying paper, but that was it. It ended with the pencil scrawl at the top of that paper. She seemed to have no life until she left England bound for Vermont. Who was she? She called to me, but I could not hear clearly. There was no maiden name, no census record that made sense before she stepped onto the boat as Mrs. Symons and alighted with a new spelling, Mrs. Simons. As I set out to ascertain the details of this life, I grew close to Mary Ann, even talking to her as I waited for search engines to spider through records or for emails to arrive from parish clerks. I learned to listen for her voice with every click of the mouse. I had to dig deep into what life was like in Cornwall in the 1860s if I ever wanted to understand her. To answer my “who” question, I had to first ask others: where, what, how, and why. Ever so slowly, I grew into a qualitative genealogist, thanks to the mysterious Mrs. Symons. 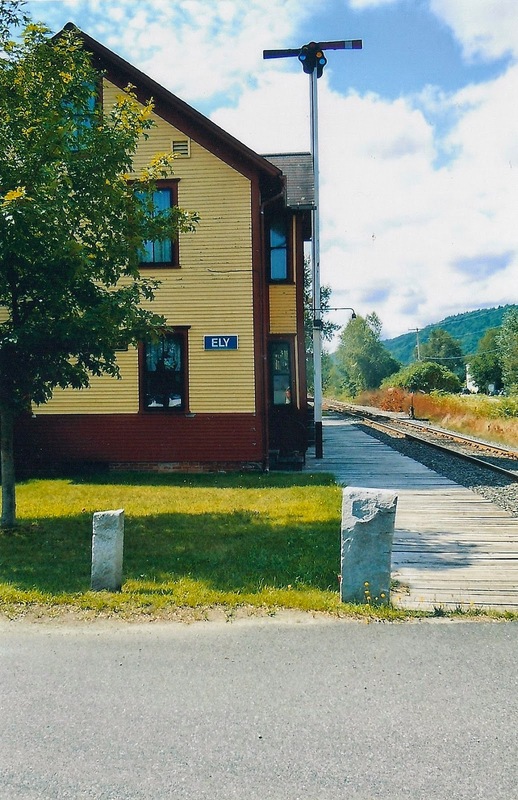 My first trip to Ely, Vermont took me to the neatly manicured train station. 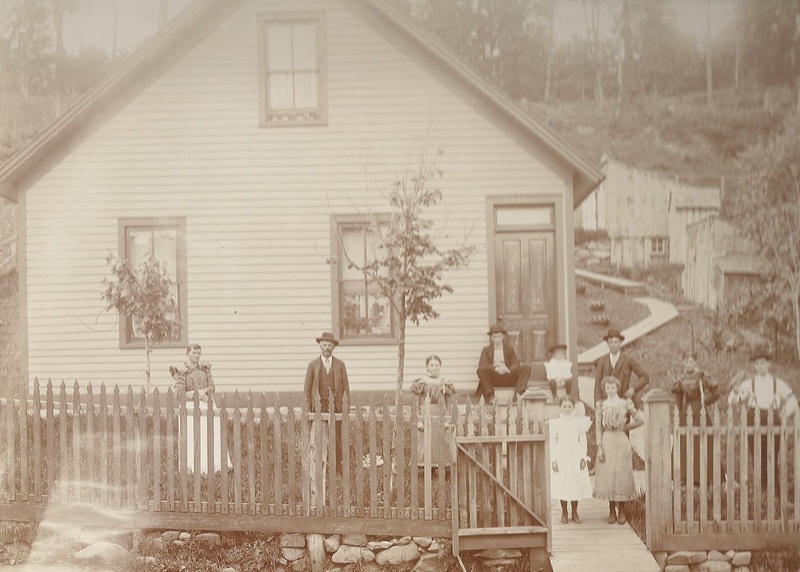 I knew Mary Ann’s first U.S. home was the tiny mining village of Ely, Vermont. The town’s name is a legend in our family. Pa was incredibly proud of his birthplace. In my mind, Ely conjured up a portrait of serenity and beauty, for that was part of the story. Even the handwritten card from Pa’s funeral, noted that he was born in Ely, Vermont. Ely and then life in Ishpeming, Michigan. That was the extent of my knowledge. But even that wasn’t accurate as I was to later discover. Mary Ann had come from somewhere in Cornwall. But where? My first bit of information came when I typed her name into Ancestry.com. Was it spelled Simons, Symons, Simmons, Symmons, or even Symonds? All of these did eventually show up at one time or another. But my first bit of on-line information should have more of a clue than I originally gave it credit for. Instead, I concentrated on my disappointment as the steerage section of the Minnesota lists a Mrs. Symons, aged 36 along with three children, Thomas, Harriett, and Charles. “How could they not even list her first name?” I wondered and even mused, a bit angrily, on Facebook. It seemed she had no identity beyond wife. But I was looking at the list with my twenty-first century, progressive feminist lens, infused with my unsophisticated genealogy understanding, and my own name and date passion. I was wrong. That entry held a panoply of clues which I ignored. This first minor discovery, which later revealed more information, did provide me with a starting point. She had arrived in New York on 13 September 1870. I rather dismissively added to this to my small stack of name and date driven data about Mary Ann and sought more. For at that time, I merely wanted her maiden name so I could trace her line further back. Armed with the name Simons and location, Ely, I found her in the 1880 United States census. By then John, age 7 and Stephen, age 4 had joined the two older Simons’ boys, Thomas and Charles. Harriett was not listed as residing in the household. A quick search revealed Mary Ann’s daughter had married husband Thomas Richards and Pa was already a 4 year-old who had siblings, Jennie, age 5 and William, age 6 months. Mary Ann was a grandmother who had children around the same age as her grandchildren. Again, my 21st century eyes found this strange. I didn’t think to wonder about the other daughters, Mary Jane and Mary Ann, or even the son, James, whose names were listed on that precious paper. I didn’t question the inconsistencies between “the family paper” and the census evidence. This didn’t serve what was my purpose at the time, as I was not yet consumed with the person who was Mary Ann, I only viewed her as a vehicle to move further back along the family tree. As the U.S. 1890 census was destroyed in a fire, I nonchalantly searched the 1900 returns. I didn’t expect this query to return anything that I could use to trace her further back. Seemingly, I was right. Even the transcriptionist had carelessly noted her name as Mrs. M Mark Meous, a widow. Yet, somehow, despite the mangled name, Ancestry’s search engine had found her. 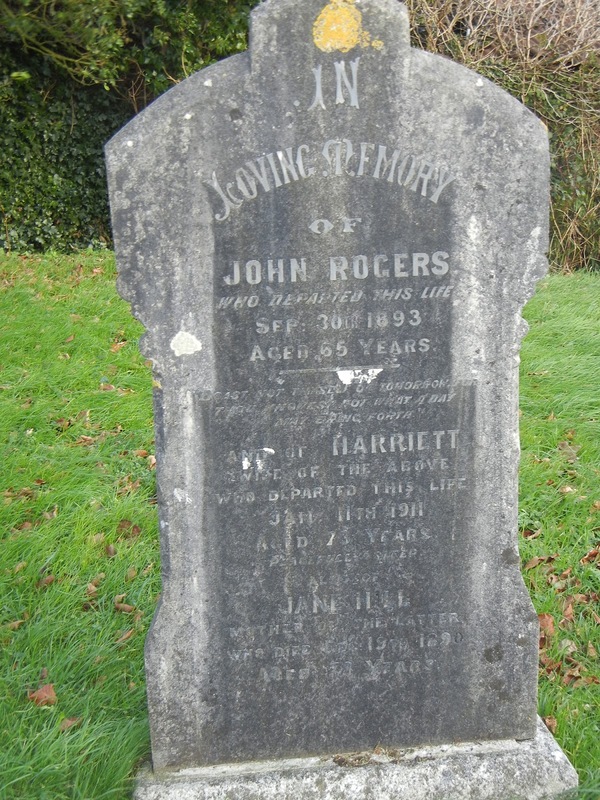 The census taker, on that day in June 1900, had crossed out daughter Harriett’s name and written in the name of Thomas as residing in the house with her. I routinely saved the census to the profile I was creating of Mary Ann and turned again backward. I checked the English 1861 census and found her married to husband Thomas Symons with children Mary Ann and Mary Jane along with my great great grandmother, Harriett. But there was no clue as to maiden name, or so I thought. I ignored the children as I had that information on the family paper and forged ahead with my quest. The table was set with rich questions that I hadn’t yet thought to ask. But I was focused on the pursuit for her maiden name, which was fraught with more obstacles than either living family members, or I had ever been aware. These I share with two goals: In hopes others will not make my same errors and to validate the intense desire to reveal the person that was and is Mary Ann. Throughout and likely because of the search, I felt her presence. That much became clear to me. But for now, my search was at a standstill. Mary Ann was that inevitable brick wall faced by so many. But I was wearing blinders. These needed to be shed before I could break through what I thought to be a solid obstacle. The treasured family paper gave me Mary Ann’s birthdate but without a maiden name, I could not locate her parents and thus garner more names for my tree collection. I became obsessed with finding this name. Either her death certificate or even the death certificate of my great great grandmother, Harriett should contain this precious information. Asking my mother was of little use as she had never asked these kinds of questions or remembered hearing what I considered to be essential family data. So, I sought these certificates. Alas, Harriett’s death certificate showed that the informant did not remember her mother’s maiden name. To make matters worse, there was no certificate for Mary Ann in the Marquette County Courthouse. I turned to another source and emailed a clerk in Orange County, Vermont who located Harriett’s marriage license. The morning it arrived in my inbox, tears came to my eyes as under mother’s name, only the words, Mary Ann, were listed. Certain that there had been an error by the person looking for Mary Ann’s death certificate at the Marquette County Courthouse, I asked my niece to go back, but like me, she discovered no certificate existed. In subsequent visits to Marquette, I took to sitting in the darkened microfiche room at the Peter White Public Library. Here I mined through the local paper, pausing to see on the screen the reality of Mary Ann’s world. I halted the machine’s reels to look at advertisements of the day. False teeth for the exorbitant price of $20 and two pounds of hamburger meat for 25 cents made me smile. I laughed out loud at the articles announcing a person had traveled to Ishpeming from Negaunee, the mileage a pittance by today’s standards. It was a small notice in The Mining Journal, but one that held many treasures about Mary Ann's life. When I found Mary Ann’s short obituary, scraps of information began to take shape for me and paint a richer portrait of Mary Ann than her name, birth, marriage, and death dates ever could. I learned she had been confined to her bed since May with breast cancer. While I did not pay attention to the children’s names mentioned in the paragraph, I was beginning to consider Mary Ann’s canvas, the era in which she walked and talked, her possible friendships, family relationships, and daily routine. The obituary said she was “highly respected by all.” What had she done to receive that accolade? The few sentences began to stir my sense of wonder. She had been “ailing” for two years. Who had helped her? How did she manage? The connections started to come into focus as I wondered about the moment that census taker came to her door in June of 1900. Did he come to her bedside? Did she struggle to the door? Could Harriett’s presence as a caretaker for the day explain why her name was first written on the form and then crossed out? I was moving toward a full portrait of Mary Ann Simons. These are the steps I may not have taken had her maiden name readily appeared for me. Mary Ann had become my focus. She was stubborn and unyielding, her Cornish life shrouded from me. But the search for her changed the way I view genealogy. The endless hours of frustration, puzzlement, and reaching out for help enhanced my blossoming desire to know the person of Mary Ann. Because I could not move forward in my search, I began to backtrack and re-examine my methodology. 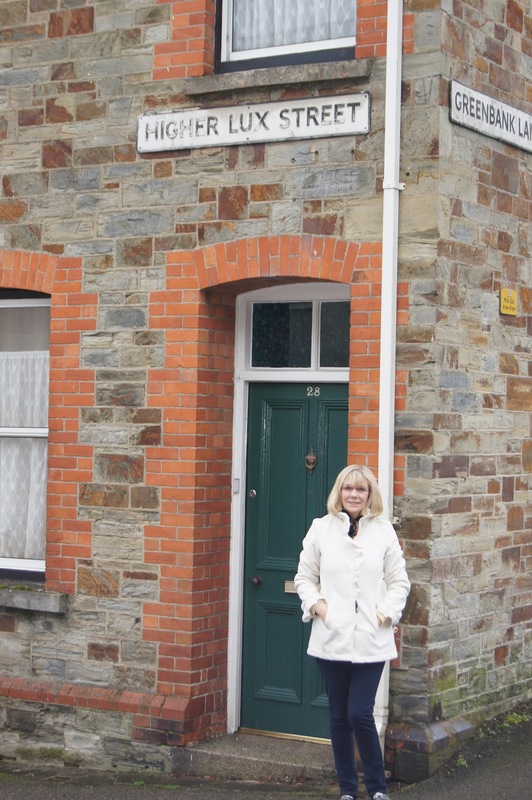 Knowing that the 1861 census listed her as living in St. Ive, I began here, finally taking careful note that Mary Ann gave her birthplace as St. Germans, Cornwall. The three daughters listed on the entry were not a surprise as the family paper had listed Mary Ann, Harriett, and Mary Jane. I was finally scouring the census for any little clues I could find, a skill that accomplished genealogists regularly practice, and finally my novice eyes were opening to those clues I had previously missed. The census did reveal a major obstacle; and while it seemed, at first, an almost insurmountable hurdle, it revealed a more complex portrait of Mary Ann. The surname of daughter, Mary Jane was not Symons. The census taker had noted her name as Mary Jane Davy and identified her as the daughter-in-law of the head of household, Thomas. What did this strange designation mean? At seven years old surely she could not be married? Delving into this, I learned that the term beside Mary Jane’s name was a common designation of the era for stepdaughter. A range of emotions flooded me. 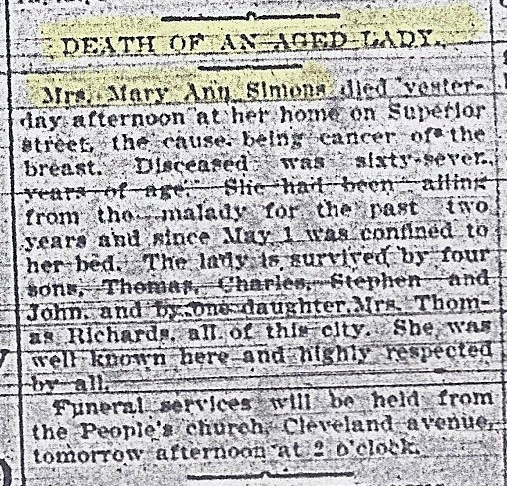 I reached for my precious paper, trying to understand why the writer (likely Harriett Simons) had not indicated this on her family “tree.” I felt a punch of horror; first, I am ashamed to admit, only for myself, as this meant my Mary Ann had been married before she married Thomas Symons. Selfishly, I groaned. There was an added layer of married names now. This would make finding her maiden name even more difficult. When this self-centered thought passed, I began to feel for Mary Ann. Here was a woman, living in a time when life for a widow with a child to support was difficult. How had she managed to provide for herself and daughter? How had this impacted her life? Thinking back to the passenger list of the Minnesota, I realized that neither daughter Mary Ann or Mary Jane had accompanied the family to Vermont. I wondered if the two sisters had stayed behind with the family of Mary Ann’s first husband, Mr. Davy. Making connections between sources was opening doors and inviting me into a new realm of my family. I wrote to Charles Simons’ granddaughter to ask if she had any knowledge of the two girls ever living in the United States, but she did not. Meanwhile, I began searching for the marriage record of Mary Ann and Thomas, as now that I knew to look for Mary Ann Davy, I thought the index search would finally reveal her. A bit of Ancestry detective work revealed a Mary Ann Hill’s marriage to James Davey in the first quarter of 1852. But was this my Mary Ann? If I had been more experienced, I would have immediately checked the 1861 census for near-by families. But my inexperience reigned. I believed I had no way of confirming if this was the Mary Ann I sought. Later I noticed that a Thomas Symonds was one of three people listed on the England & Wales Free BMD Marriage Index for the fourth quarter of 1957. I reasoned that the first two people were likely a couple and Thomas’ bride might be listed on another page. But, because this seemed my last hope, I reached for my credit card and purchased Thomas Symonds’ marriage license. The waiting began. Almost 153 years to the date after Thomas and Mary Ann’s marriage ceremony, my cell phone signaled an email from Ancestry. Glancing at it, I saw the license was ready for me. I recall my hands were shaking as I opened the file. Had my money been wasted or would this be the golden ticket? I struggled to enlarge the green-tinted paper and gasped. It was my Mary Ann! She was listed as Mary Ann Davy, a widow whose father was named Christopher Hill. Here she was, the family paper wrong about her marriage date; however, being slightly math-challenged myself, I understood the numeral exchanges that likely took place. Every detail on that license became a treasure. Her story began to unfurl in front of my eyes. Closer than ever to the person that was Mary Ann, I eagerly raced to Ancestry.com to take another look at that 1861 census. I had overlooked a key detail that was plainly evident now: Her parents had lived next door to her. Information lit up my computer screen. I easily went back two more generations; but by this time, I was awash in the details of her life, no longer focused on the race backwards. Now it was the richness of Mary Ann Hill Symons I wanted to understand. Occupations, literacy, witnesses of marriage ceremonies formed her story. I felt my great great great grandmother. Now, in that moment, I knew I needed to understand her more fully. Yet, before I could completely do that, more difficult lessons awaited me. In those days of baby steps, I brashly wrote a family history, detailing the life of Mary Ann and her mother Jane Ruse Hill. Details gleaned from census returns, such as Mary Ann’s days as a seamstress and her ability to read and write were included in what I now view as merely a factual list of her accomplishments. As I named her children, I was still confused as to what had happened to Mary Jane and Mary Ann. They were listed along with son, James, on the faded family paper. Like the two Cornish-born daughters, James never appeared on a U.S. census but all three had been etched into my mind thanks to the Simons' ancestor who wrote the family names and connections on that lined paper so long ago. Giving what I believed to be the finished product of Mary Ann’s life story to my Simons’ relatives, I sat back, wondering where to turn my attention. As I was in Marquette, my curiosity got the better of me, and I once again made my way into the marble-lined hallways of the Courthouse, made famous by the book and subsequent movie, “Anatomy of a Murder.” Here, the musty smell and intricate woodwork conjure up the spirit of the past. The leather-bound record books, with names that seemed drawn rather than written, create a longing for the era when folks had time for these niceties of life. I was not just in search of Mary Ann but was branching out to the Sundberg side of the family. Rather than asking for specific information, I paid the nominal fee to examine the index myself. As I paged through the 1930s, deaths of Mary Ann’s children appeared. I decided to take a detour from the Sundbergs and asked for the records of the Simons' brothers. And, I audibly groaned. It was a groan so loud that the clerk asked me if I was okay. With each hand pound to my head, I chastised myself for the rookie mistake of failing to look at sibling information. Yes, I had studied Harriett’s death certificate and noted the blank section next to her mother’s maiden name, but here were the others, the sons, whose certificates bore the name, Mary Ann Hill. Had I just looked at the siblings, the seemingly long road to her maiden name would have been shortened. It was a mistake that had cost me time and money, but it was a lesson that was now drilled into me and perhaps because of it, I had felt Mary Ann more fully than any other ancestor. The second hard lesson came a few days later when Colleen called, thanking me for Mary Ann’s story. She hesitated, but finally admitted she had asked the living members of the Simons’ family and no one had heard of James. “But he was on the family paper!” I thought. Confused, I was anxious to return home and recheck my records. 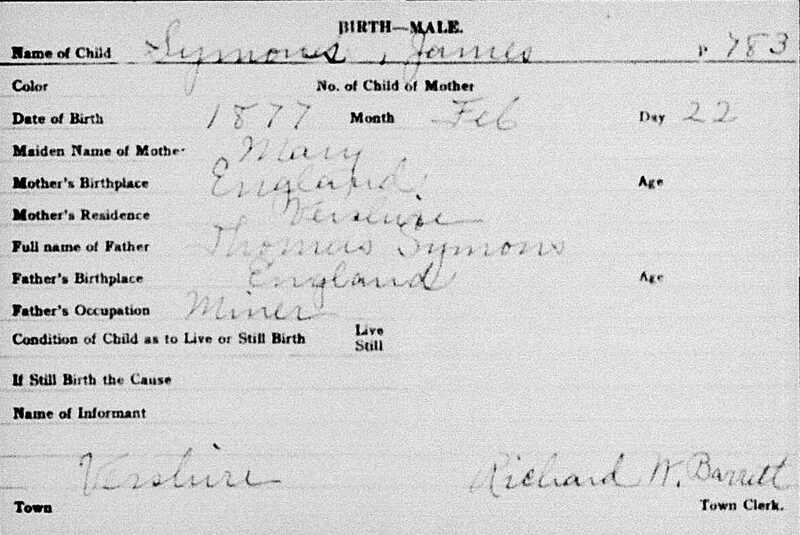 Scrutinizing my treasure trove of records, the name James, birth date 22 February 1877 was clearly listed under children on the family record page. But he did not appear on any census transcripts. What had happened to him? The question prompted a more thorough examination of the family’s time in Ely Vermont as his birth clearly took place at this point in the family history. This led to yet another revelation. The name Ely was actually Vershire. The Cornish mining community had changed the name from Vershire to Ely in 1878 to honor the owner of the mine; but economic tensions began to swell in the area leading to a reversal of the moniker in 1881. This meant that my exploration and photos of the railroad stop now called Ely was likely not the exact spot the Simons’ family called home. At that point I realized another trip to Vermont would be needed. But the question of James Symons remained. Determined to prove his existence, I wrote to the Vermont Clerk’s office. 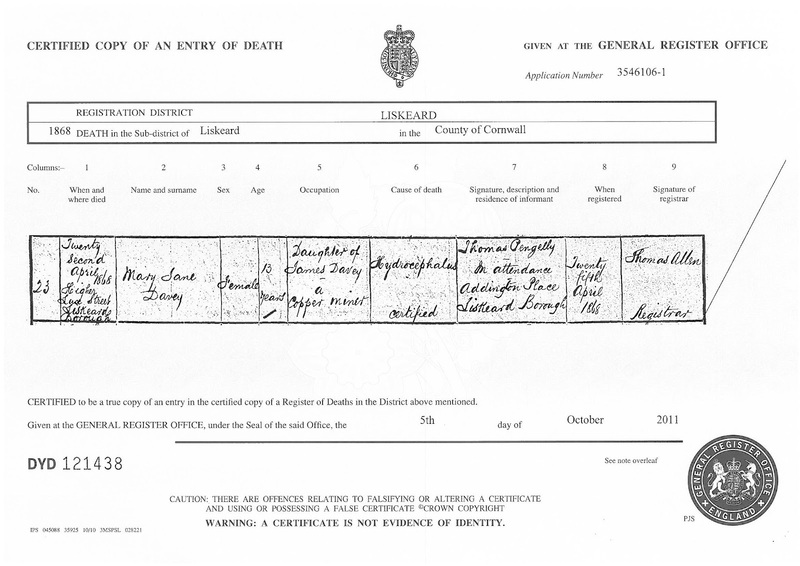 The birth record of James. When his birth certificate arrived, I was faced with a harsh reality. While it confirmed his birth on the exact date written on the family paper, it forced me to consider his absence in the memory of the living Simons’ family. This, along with the notable exclusion of James Symons on any subsequent census records, opened my eyes to the tragedy of Mary Ann’s life. Her son must have died. Writing again to the Vermont clerk, I requested her help in searching for James in the death records. At this point I was beholden to so many: the people at Ancestry.com, those in the Cornwall Family History Society, the clerks at the Marquette County Courthouse, and now another person made it her quest to solve the mystery of James, with no death date to guide her. The only clue was his absence in the United States census of 1880. Had I paid more attention to the census records, I would have noted his absence earlier. The clerk's reply email, just a few days later, further unraveled the complexities of Mary Ann. James had died, just five months after birth on 30 July 1877 of Cholera Morbus. Mary Ann experienced the loss of a child. I felt a jab. There is no greater pain. The death of baby James cut through me deeply. 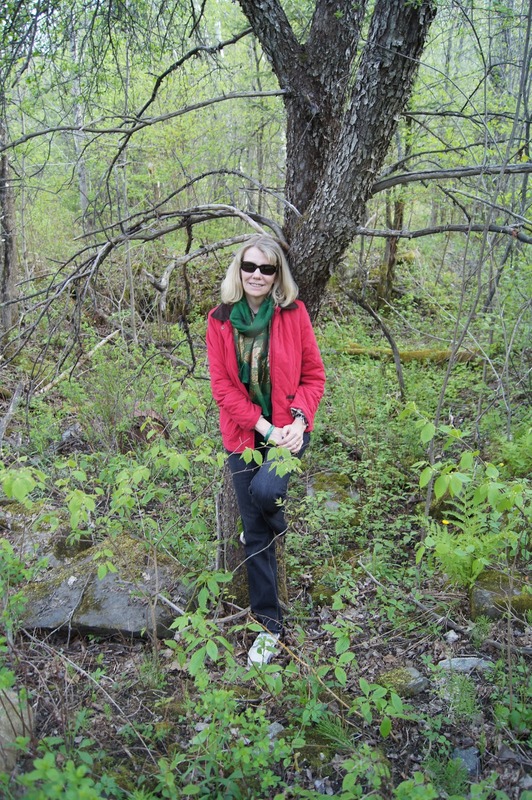 There was the initial stab of grief but then, a constant throbbing of pain continued, a kind of connection with Mary Ann that I had not anticipated when I set out on my genealogical journey. I felt one with her and the answer to the question that had plagued me for several months was coursing through my veins, the fate of young Mary Ann Symons and Mary Jane Davey. I now knew the answer. Without ever searching for the paper trail, their untimely deaths surged through the strands of my DNA. Perhaps it had always been there, and I had been unwilling to admit the awful truth. Despite the intense “knowing” within me, I had to see the records. Admittedly my hands were shaking as I searched for their names in the death registry on Ancestry.com, but this was not an anxious shake for I already knew the answer. This was a mournful shaking. When their names appeared, within days of each other in 1868, I was not surprised, yet I still felt the stark reality of my own emptiness. These two girls had been a part of my life and curiosity for so long; and now 143 years later, I profoundly felt their absence. I mourned. This served to intensify my connection with Mary Ann. I reached out to her through the years, past the generations, to connect with and to console her. She had lost two daughters within four days of each other. And she had been seven months pregnant with Charles Symons. Death records of "the little girls," Mary Ann's daughters. Suddenly I felt fortunate; and the colliding of events and decisions almost overwhelmed me. Death had swept through Liskeard. In their house on Higher Lux Street, two daughters were taken. Two children remained. One of the spared was my great great grandmother. And Mary Ann was far along in a pregnancy that would welcome the grandfather of a treasured part of my young life into the world. These are the inexplicable accidents of the past that interconnect in such a way to form us and even allow our existence. Is this by design? In some mysterious fashion, like the colors of a kaleidoscope, these events, sorrows, joys, and wrenching decisions, had woven fate into our ancestral portrait of today. The birthplace of Mary Ann. Amazingly enough, my dad's ancestors had also called the tiny hamlet of St. Ive home, about 100 years before Mary Ann lived here. I have visited this grave 3 times and each visit fills me with a powerful bridge to the past. 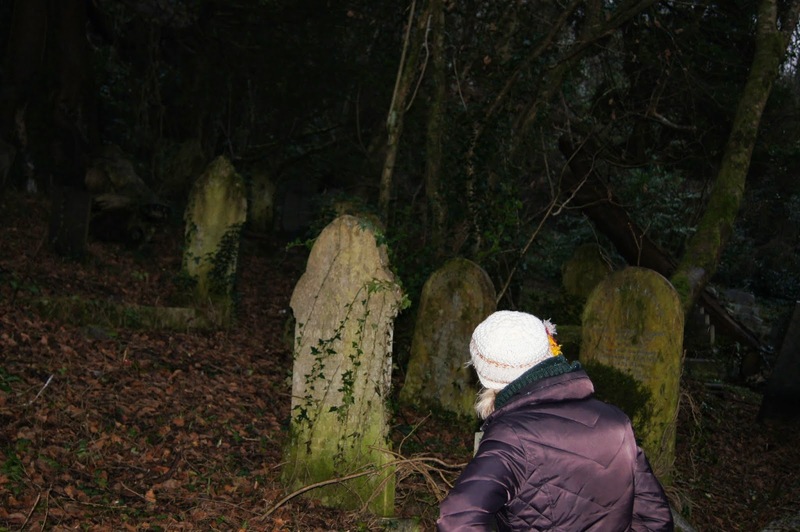 A 4:00 pm mid-January trek through the St. German's cemetery. Feeling the past ~ Remembering Mary Ann's sorrow. Ancestry.com records had given me a glimpse into Mary Ann’s first steps on U.S. soil. I knew she had stood without her husband, her children in tow, on the deck of the Minnesota as it pulled into New York Harbor that day in September of 1870. The U.S. census, taken in June of that year showed Thomas was already at work in the mines of Vershire, Vermont. I had little understanding of what this experience must have been like for Mary Ann and her young family. So much has been written about passengers chugging into this harbor, waving at the Statue of Liberty, but then undergoing the humiliation and fear of Ellis Island. I knew Mary Ann had arrived before either of these landmarks were in place. What had happened? The rain captured the feel of Castle Gardens. It was by chance that I came across the name, Castle Garden, while reading the novel, The Shoemaker’s Wife. This place with the welcoming name was the entry point for immigrants between 1855 and 1890. But it was not so welcoming. New arrivals were herded off the ship that had held them for the two-week voyage. They were crowded together for processing and examination. But the degradation didn’t stop there. Once freed from the dank conditions that “greeted them to the land of opportunity” hawkers of all sorts usually accosted them with false promises ranging from a safe and inexpensive journey to an intended destination or employment that resulted in years of slave labor. The streets of New York were not kind to newcomers. We often conjure up a picture of the immigrant, beaming with hope for the opportunities that waited. But the truth was far different. Our ancestors likely felt trepidation, as they were not welcomed but rather humiliated upon arrival and then taken advantage of by unscrupulous vendors. I can only imagine Mary Ann pulling her children close before finally boarding a train, clutching the directions her husband had asked someone to write for her. Thomas was illiterate but Mary Ann could read and write, likely thanks to her schoolteacher mother. A Vermont locomotive of the era. The family likely were passengers on such a train. Following the path of others like her, it is probable she boarded a train for the next part of her journey. New England’s autumn countryside was just beginning to glow with the beauty of the season showing off its finery before the dark of winter descended. When the snow fell, the landscape would hold its white covering for months, something unusual for a family used to the more temperate climate of Cornwall. I have no clues as to Mary Ann’s state of mind and am left to wonder if she felt excitement or trepidation as she left her homeland, taking her children on such a journey, and setting up a new household in this faraway place. It is likely she had a panoply of emotions. The train stopped at White River Junction, Vermont. Anecdotal stories passed down by others who had made similar journeys indicate that the new family was in all probability met by a horse drawn buggy and bumped along the last 40 miles to the mining community of Vershire, a place that was populated by newcomers and run by those fueled with thoughts of riches. The area is contaminated. The mines, long shuttered, did their damage to the environment. Today this spot that once held so much promise for so many is now an EPA Super Fund site. Its grounds are not safe for schoolchildren to walk. Here and there a rock still wears a jacket of the toxic chemicals that once covered the area. This was to be home for the Symons and Richards families for eleven years. My great great grandmother Harriet was married here at 14 years of age, and my great grandfather treasured the memory of the town he called Ely to his dying day. One of the many possible house foundations. Several families in my "tree" lived in the area. It was Mother's Day morning when we visited the Ely Cemetery. I no longer feel great despair at the failure of my ancestors to mark the graves of such young children. My feelings had evolved since the days I lamented this lapse in the Cornish churchyards devoid of monuments for Mary Jane and Mary Ann. I made my personal peace as my growing knowledge revealed their plight. Today, the absence of such a shrine gives me an even greater understanding of all that happened in the century between my life and theirs. In those years, my people rose from austerity and the obscurity of often-illiterate paupers to professionals with graduate degrees who are teachers, professors, councilors, and scholars. This is the living memorial. 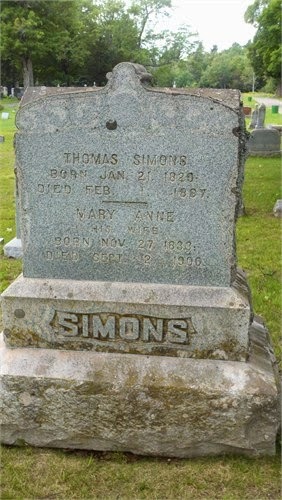 The Simons' marker in Ishpeming. As with many markers, years are a bit incorrect. Even my mother and other relatives had never noticed this gravestone. I had come full circle. I had first digitally chased Mary Ann Hill Davy Symons through Ancestry.com and via email exchanges with always-helpful Cornish Parish clerks. 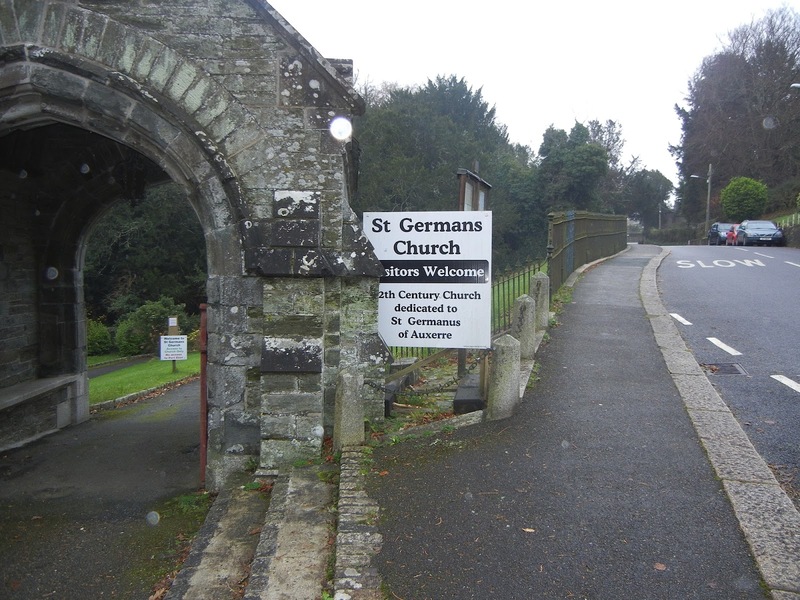 I then made the physical journey across the ocean to her homeland and tramped through her towns: St. Ive, Menheniot, St. Germans, and Liskeard Cornwall. 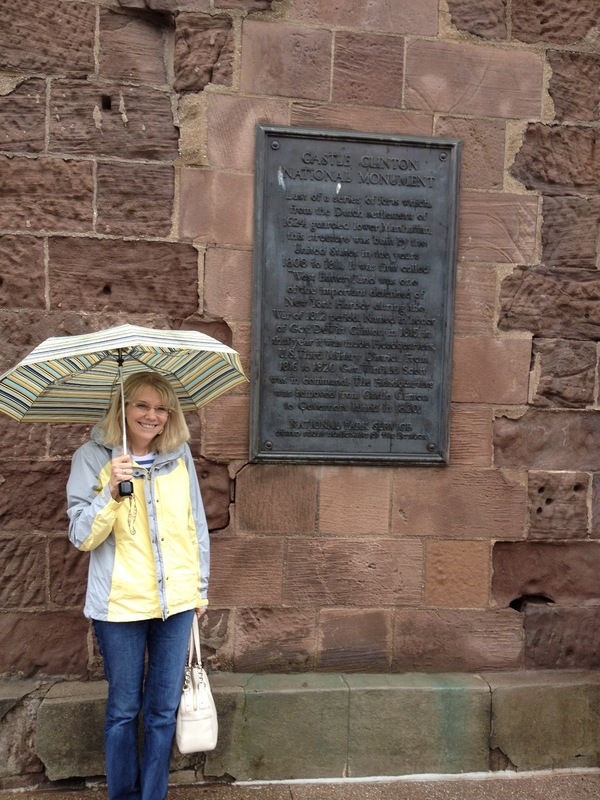 In a fitting setting, I had stood in the rain at Castle Garden where she first landed in the United States. I peered into her life in Vershire/Ely Vermont. I knew where her monument marked the place of her burial in the Ishpeming, Michigan Cemetery. I had found a child that no living relative knew had existed. I solved the mystery of Mary Ann and Mary Jane and in that solution gained a clearer understanding of the ways of Victorian England. Here and there the unexpected disappointments resulted in my greater understanding of Mary Ann, her circumstances, and ultimately of me. And I felt very lucky. 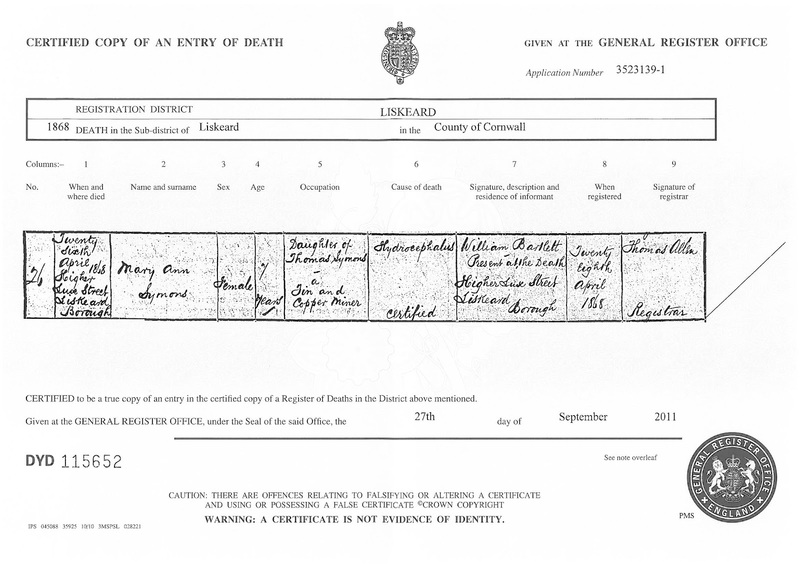 My great great great grandmother had survived whatever horrible illnesses had swept through Liskeard in 1868. She had made fateful and difficult decisions that affected me. The “what ifs” haunted me for a while, but later I came to terms with the ways of the universe. I studied the gold gilded framed photo of her daughter Harriett and family in my living room and considered how lucky I was to have it and to know the approximate date of the picture and the identity of these somber faces. I felt content. Now, I merely had to write Mary Ann’s story and then move on to another branch of my family tree. January 2012 brought the death of my dad’s sister, the last of the Hart siblings. I traveled to Marquette for her funeral, thinking this marked the turning point in my family history search. I would now devote my attention to Wilhelmina Sundberg or Ann Bennett. But those were my plans. As often happens, my ideas were not what is meant to happen. I discovered that Mary Ann wasn’t done with me yet. 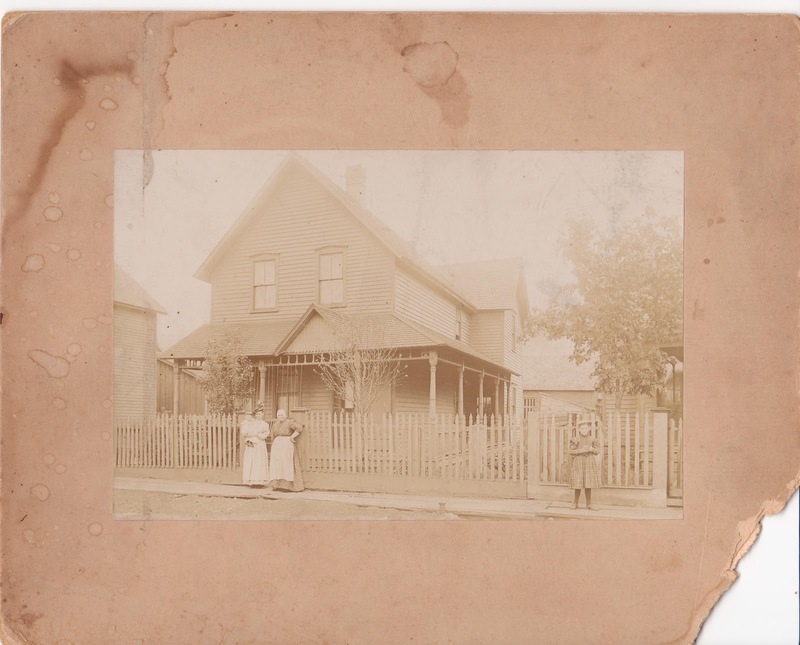 In that offhanded way my mother has of providing valuable information, she mentioned that she had an early photo of the house where she had lived with her parents and grandparents. When she pulled the faded sepia photo with its missing corner from her plastic bin, I felt tingles. For my mother, this was a photo of her house. For me, this was a photo of people. Women stood in front of this home! The photo my mother had labeled, "120 E. Superior St."
Everything about this picture looked familiar. It was the same style as the photo of Harriett and family in front of their house, the photo in the gold gilded frame. Shaking, I turned it over. Even though I recognized the stamped mark on the back of this photo as being the same as the one in my Maryland living room, the researcher in me needed to verify this vital information. I could have called my husband and had him send me a picture of the mark, but in that moment, I felt a close, private connection to Mary Ann. This was personal. It was something I needed to do myself. I had learned to trust the feelings that bathed me in moments like this. I stared at the heavyset older woman wearing the white apron, arm on her hip, in a determined pose. She stared back. Yes, she was of the age Mary Ann would have been between 1897 and 1900 when the photo was taken. Had she lived in this house then? 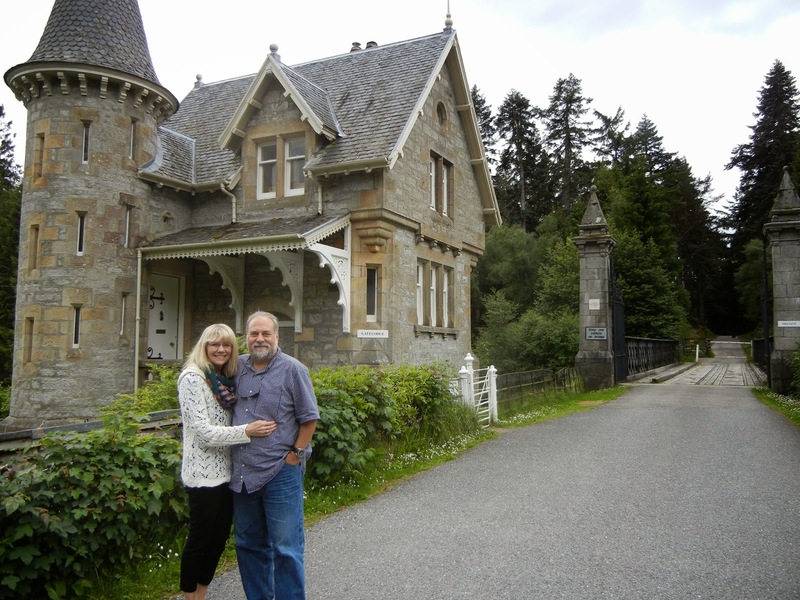 My mother could only tell me that her father had purchased the house from his in-laws, the Simons’ family. It was a step in the right direction. Could I dare hope I was finally, after all this time, looking at Mary Ann? In Marquette, I did what I could and digitally used Ancestry.com to verify that the 1900 U.S. Census showed Mary Ann living at 120 E. Superior Street in that year. One verification was made. Even though every part of me believed this woman to be Mary Ann, I breathed a sigh of relief when I returned home and compared the marks. They matched. Another verification made. Someone from the Michigan View Company in Saginaw, MI must have traveled through the neighborhoods taking photos on a pleasant spring day. While I could say it was my training that required more proof, in reality because I had trailed Mary Ann for so long and made a multitude of errors, I feared I would misidentify her. Perhaps at this point, it was my emotions that pushed me further. My gold gilded photo had been dated between 1897-1900. While I knew Mary Ann lived at 120 E. Superior Street in 1900, had she lived here in 1897? I would not be satisfied without this information. I reasoned that a trip back to the Marquette County Historical Society would allow me to examine city directories from these years. I just had to be patient. Several weeks later, I again logged onto Ancestry.com, thinking it was time to turn my attention to the Sundbergs. Why not? It might lead to a Swedish excursion! To my surprise, when searching for Frank Sundberg, an Ishpeming City Directory for 1897 popped up. This was new or I hadn’t seen these directories before. Almost forgetting my obsession with Mary Ann’s residence, I examined the Sundberg list of addresses. Without much conscious realization of my actions, I flipped back a few pages to the Simons’ listings on the digital directory. I saw it. Mary Ann Simons, 120 E. Superior St.
She HAD lived here all the while! I picked up the photo to finally gaze into the face of the woman who had intrigued me for so long. She had left her history as a type of scavenger hunt to be unearthed in tiny pieces. Likely it never entered her mind that her great great great granddaughter would long to know her story. As I have walked this journey, I have learned about myself. Somewhere deep in my DNA is the spirit of my ancestors' adventure and their tenacity, the drive to change circumstances and overcome hardship. In the remembrance of these intangible inheritances, I have learned what it means to forge ahead toward a goal, despite the tragedies of life. It is in this intersection of genetics and experience that we find ourselves, lessons from the past, awareness in our present, and hope for the future. In doing so, I can’t shake the feeling that Mary Ann is here, watching over and feeling a bit of pride at how her family tree has survived and branched into the world. This is the tale I told, over a course of numerous posts and years of my patient husband driving the winding trails of Cornwall, peering into microfiche screens, and becoming as excited as I over the discoveries. We shared the pain of the lost "little girls" and the realization that while some grave markers would never be found, we could hold these dear ones in our hearts. Through all of our adventures, Greg gave me the joy of finding Mary Ann. But it was more. Together, we traced a life, united in our shared laughter, frustration, and rich experiences. I am grateful for that gift he gave me. On April 11, 2014, he unexpectedly passed away in Beijing, China. I cannot write about that yet. I am filled with too much sorrow. But I look back to the Mary Ann we both came to know, and I draw strength, for I know she, too, lived with much pain and separation. I feel my great great great grandmother's presence as she whispers to me, penetrating my shroud of loneliness.